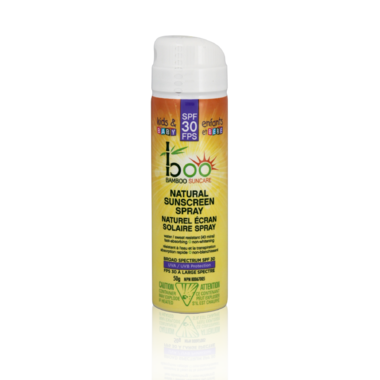 Boo Bamboo Baby & Kids Natural Sunscreen Spray with Bamboo Extract provides you with natural Broad Spectrum UVA/UVB protection. Caution: For external use only. Discontinue use if skin irritation develops or increases. If irritation persists, consult a health care practitioner.Avoid contact with eyes. If contact occurs, rinse thoroughly with water. Consult a health care practioner prior to use on children less than six months of age.May stain or damage some fabrics or surfaces. Perfect purse sized natural sunscreen!